Why do you want this character? : I would like to play as Whizzer because she was a good chunk of my 4-8 year old life, maybe even stretching into 9 yr. old, being one of the toys I played with the most when we got some from Goodwill, because anyone in Equestria that knows me has knowledge that I'm 11. I wasn't BORN during G1. But thank god for Goodwill, or I would have backed way off from the brony fanbase, but we're getting off topic here. She's still one of my favorites from the original Generation, and it's staying that way. How often are you online? : Pretty much everyday but I have a life, I'll notify if I'll be offline for awhile. Special Somepony: No, but kind of looking. Residence: Ponyville, but Cloudsdale if she works late. Short Introduction: Hey, I'm Whizzer! I'm only the fastest flier in all of Ponyland! Sorry about the fast talking, I'm in a hurry. Gotta gallop! Backstory: Hailing from Ponyland, this pegasus is a long way from home.. Or what was her home. She spent her time in Ponyland for years doing odd jobs and participating in various races. But as much as she loved Ponyland and Paradise Estates, she was getting the homeland equivalent of Cabin Fever- she wanted to get out and explore. At that, she didn't hesitate to grab the next train to Equestria where she was dropped off around Hoofington, and that took all the bits she'd saved, so the pink pegasus traveled by hoof and wing the rest of the way to Ponyville, using Cloudsdale and the train tracks as guides as some of it hovered over the small village. Mostly by wing, but if the clouds got tough and she found she couldn't force her way through, she traveled by hoof. Of course she found shelter in small towns not worthy to be on the map and, over the course of 6 months, found her way to Ponyville. A couple months more got her a job, friends, and confidence. Appearance: Soft pink coat and tri-colored pastel rainbow mess of hair set the personality and speed of this fast and not-so-furious twinkle-eyed mare, her eyes completing the look with the constant wild flare in the amethyst depths, eager for adventure and glowing with excitement. The propeller caps on her flanks are almost identical to that of the beanie sometimes nestled between her ears and forced down over her tangled, wind-ruffled hair: the prize for winning a race back in Ponyland, although it's rare to find her wearing it as it's so special, even without the winning factor, being made from moonbeams, flashing comet tails, and a glittering stardust propeller. Personality: Impatient and fast-talking, Whizzer means well, but it's just in her nature to be hasty and unable to wait. She loves to race and compete and is okay with losing, and is anything but a sore winner. Conversations may pass quick as she's the speediest talker in Ponyland, but don't let it rub you the wrong way, it's just the way she rolls. Job: The Cloud Department, rather the branch that Whizzer works in, organizes the clouds to match the weather schedules and works in conjunction with the corresponding precipitation departments to prepare them to rain or snow down on the patch of land they had arranged. They also clear and clump the clouds for sunny and cloudy days, respectively. Whizzer works mostly as a cloud clearer and placer, but occasionally does other things like work with the precipitation departments to load the clouds. Sample Post: Whizzer's eyes flicked over the round track, at the measurement device- an ane-something, as Twilight had called it, shaking with excitement, waiting impatiently for her turn. Just one more to go before she could take off. She barely kept her wings at her sides. She barely kept back as the pony before her charged and took off. She didn't hear the sound of Twilight's report of their wingpower, as she was already stepping forward, glaring down the track. She shook herself one last time and her wings snapped open, a crack even sounded, and even was heard when she stretched. Whizzer leaned forward on her front hooves and beat her wings hard, eyes screwed shut, teeth clenched. When she let go of the ground she shot straight forward, tangle of mane and tail sticking straight tout behind her, wings still beating almost as hard as the Flutter ponies performing the Utter Flutter, eyes watering and spittle flying back from her blown-back cheek, revealing all her teeth, arms stretched straight forward and legs stuck back, wind rushing and further matting her tail. She didn't even notice as she ripped straight past the measurement device, and almost crashed into a tree seconds after. She would have if it weren't for the cloud somepony had quickly placed, holding it there. The shape of Rainbow Dash appeared from behind the cloud, nodding approvingly. She listened as Twilight reported her wingpower: 15.6. Almost as much as Rainbow's first try last time. She gave a weak smile and jumped off the cloud, staggering to the clump of ponies that had already been measured, collapsing to the ground to watch the others and droop her wings to the ground, too tired and unable due to bits of cloud stuck in the feathers of her wings to close them. Her energy soon returned, and she was twitching and revving to go again in no time. OMG SO CUTE~!! And the twinkle in her eyes, gah~!! <3 Sadly, I never grew up with any of the older gen toys really, but it's great to see more popping up~!! You're approved in my books~!! Yey, thanks! 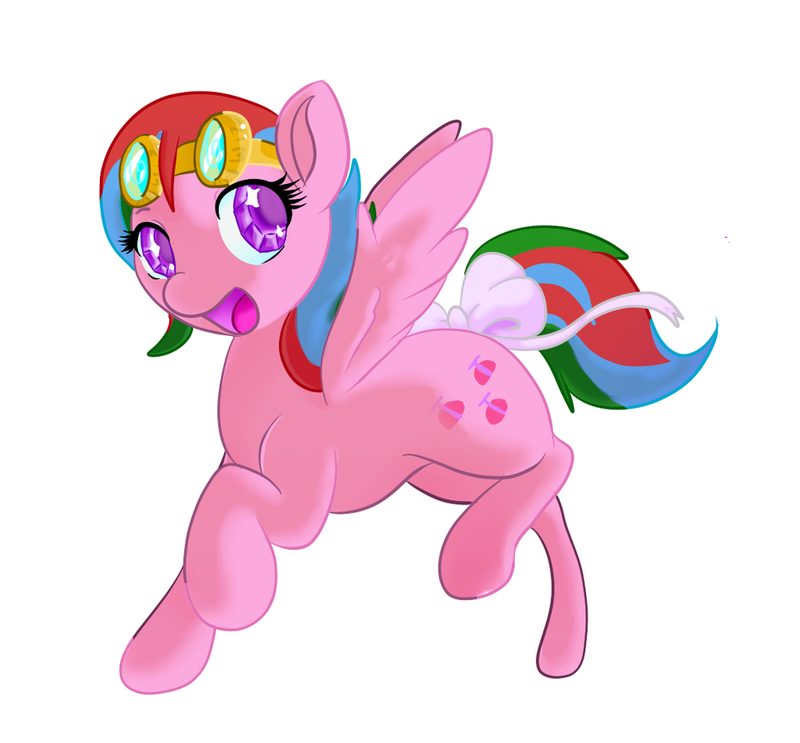 She was a twinkle-eyed pony after all~!